Even in the winter, it’s great to have something refreshing sometimes. We love regular ice cream, but we also like to cut back on fat intake too (and especially during Lent, it’s a good time to cut back!). We had a bunch of oranges on the counter, so we made sorbet. It fit the bill perfectly and it was a refreshing and delicious treat. Citrus season has been at its peak the past month, so now is a great time to make the most it! Blood oranges, grapefruits, or just regular oranges all work perfectly here, so use up what you have on hand. We guarantee you won’t be disappointed! P.S. We have the recipe doubled below. Any less and you’d hardly be able to serve more than 4 people. The sorbet bowl in the picture is probably about 1/3 of the doubled batch (or about 2-3 servings), if that gives you a good idea of how much to make depending on the number of people you plan to serve. Combine ¼ cup of the orange juice with the sugar in a small saucepan. Heat over medium heat, stirring occasionally, just until the sugar is dissolved. Remove from the heat and stir in the remaining ¾ cup of orange juice. Stir in the wine if using. Chill the mixture well in the refrigerator. Freeze in an ice cream maker according to the manufacturer’s instructions. 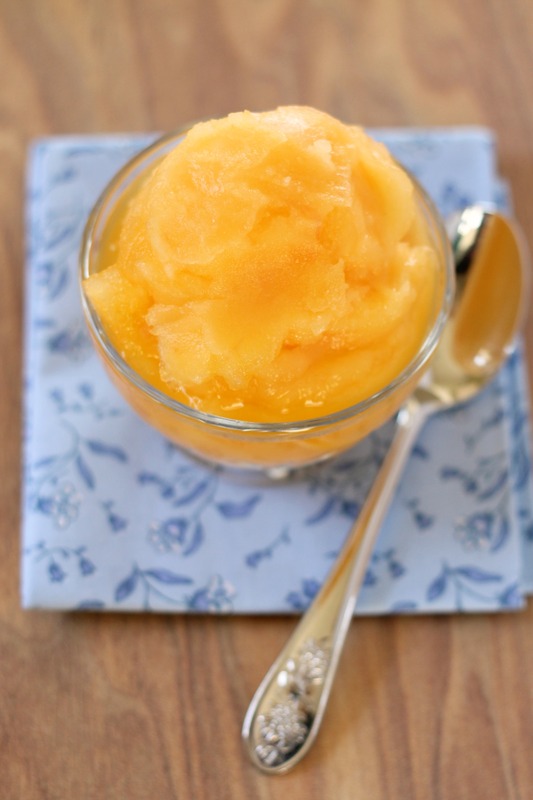 We recommend freezing the sorbet for about an hour after it finishes in the ice cream maker and then serving. Enjoy!